Natural capital encompasses the world's living and non-living natural assets. It forms the basis for environmental and economic life through natural resource production and the provision of ecosystem services. Despite the proliferation of national green growth plans in recent years, only a handful of the more than 60 such plans include strong provisions for valuing, protecting and enhancing natural capital. 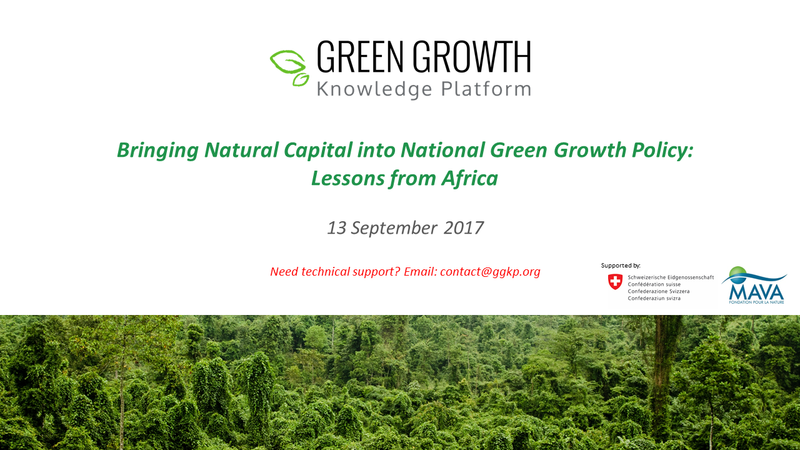 On 13 September 2017 (03:00 PM CEST), the GGKP held a webinar to explore new best practices in bringing natural capital into green growth policy making in Africa. The speakers discussed new methods for natural capital accounting and new approaches for mainstreaming natural capital in green growth planning at the national level. The speakers highlighted cases in Uganda, Mozambique, and South Africa. Speakers listed below are shown here from left to right.